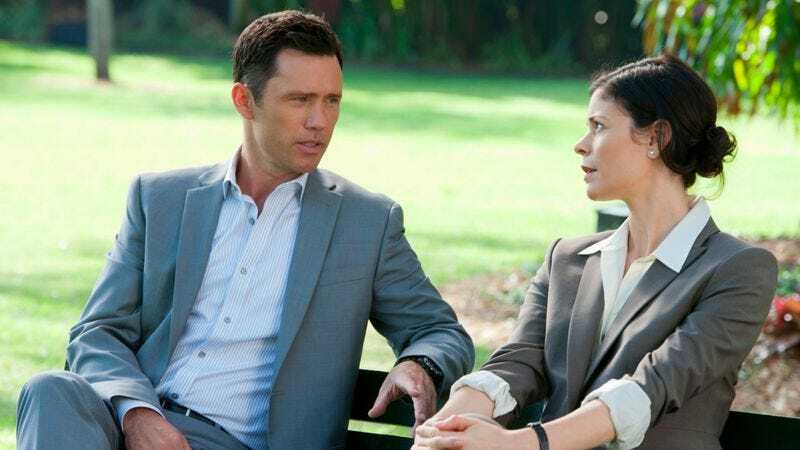 Michael Westen’s little team of three down-and-out spies has grown into a small army, with everyone getting a little piece of the action this week. Fiona’s still off in her own little women-behind-bars movie, Pearce gets into the game with her own take on the vengeance-seeking secret agent, and as predicted here last week, even boring brother Nate is on board as the latest unofficial member of Michael’s merry band. Burn Notice is getting crowded, but for now, anyway, all the ingredients are in balance. Fiona’s story is the weakest link this week, although I’m glad to see the prison storyline play out a little longer than I would have guessed. Having learned last week that she’s targeted for murder, Fi spends the hour trying to get the name of her would-be assassin. She makes a new “friend” in Ayn, the resident supplier of black market goods, who wants Fiona to arrange for the guards to be locked out of the cell block for two minutes in order to knock her new competitor out of commission. This doesn’t play out in particularly thrilling fashion, although it’s fun to see Fi continue to channel Michael’s MacGuyver side, as she builds an incendiary device out of sparklers and plaster of Paris. Pearce proves she has more in common with Michael than she’d be willing to admit, as she ropes the team into helping her take down the man who killed her fiancé years earlier. That would be Ahmed, a CIA asset with a hard drive full of MacGuffins that makes him untouchable. (It’s always fun when the show almost casually dips into the dark side of the CIA; without rubbing our noses in it, it’s a reminder that our loveable TV friends almost certainly have some real dirt in their pasts.) Michael and company hatch a plan that requires two teams of three. Michael, Jesse, and Pearce will accompany Ahmed on his vacation cruise, dose him with a drug that replicates the symptoms of meningitis, and quarantine him in sickbay. Sam, Maddie, and Nate will go to Ahmed’s home, convince his son Sharif that he’s in danger of infection, and find the MacGuffin hard drive, rendering Ahmed useless. Michael’s cruise-ship passenger look is good for a laugh, as is the fact that the production at no time even attempts to convince us that the characters are actually on a ship. (Seriously, they couldn’t spring for one green-screen shot of someone on the deck, taking in the ocean view? Even SyFy shark movies make more of an effort.) But nitpicking aside, “Last Rites” is actually an example of Burn Notice doing what it does best. Despite the dark undertones, there’s a buoyant quality to the proceedings, and an entertaining variety of interactions among the principal characters. It’s always fun when the show mixes and matches the team, and sticking poor Sam with Maddie and Nate pays dividends. Letting Pearce essentially take over the Michael role for the episode, right down to the final twist of convincing Ahmed that the Russians are behind his sickness, turns out to be a clever little shake-up. The episode ends with Michael and Fiona finally getting their first face-to-face of the year, and…I dunno, I’m still not feeling the “greatest love of all” vibe here. The fact that Michael’s reminiscence of their first meeting is almost immediately cut off by a swelling of melancholy music suggests that the writers haven’t managed to convince themselves, either. It’s not that I’m completely unwilling to buy this romance, but for whatever reason, it was a lot more believable when Michael didn’t seem to have the time of day for her. This is not the first time it seemed the show was trying to set up some sparks between Jesse and Pearce, and maybe that’s where things are headed. But at the risk of going all ’shipper on y’all, I still think Jesse and Fiona are a better match. And this episode almost went out of its way to show that Michael and Pearce are two sides of the same coin. Heck, in a certain light, they almost look alike. Finally, yogurt pays off as a useful component of a mission! For some reason, there’s no new episode next week, so let’s meet back here on July 12, shall we?